You are here: Home » Being Part of a Strong and Dynamic Community »	Mobility Scooters – a blessing or a menace? 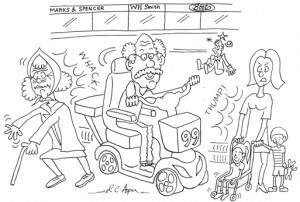 There are currently estimated to be around 250, prostate mind 000 mobility scooters in use in Britain, and although this type of equipment is not used solely by older people, an increasingly ageing population inevitably means that the number will grow. Scooters may be good news for those who rely on them for their mobility, but many people (including a significant number of KOPV members) view them as a danger and a nuisance when they are not used responsibly. The problem is, that despite use of mobility scooters being regulated by law, users are often not aware of their responsibilities, whilst local authorities and the police are failing to enforce the law. In this feature for the benefit of users and pedestrians alike, we look to highlight what the law says about safe use of disability scooters. 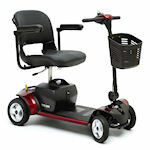 We also provide a useful guide for those looking to buy a scooter to assist their mobility. Speed Limits – These vehicles can be used on footpaths, pavements, bridleways and pedestrian areas at a maximum speed of 4mph. They can also be used on most roads at a maximum speed of 8mph. Comment: Some scooters have a switch allowing the user to switch between the 4mph and 8mph speeds, but the vehicle is being used illegally if the 8mph setting is used in pedestrian areas. Driving Licence and Test – A class 3 vehicle is not legally defined as a motor vehicle and the user is therefore not required to have a driving licence or take a test. Comment: Responsible mobility experts will be keen to provide you with proper training to help you be in proper control and at ease with your newly found freedom. If they don’t offer then ask. Tax Discs – Disabled scooters and other Class 3 vehicles are not subject to Vehicle Excise Duty (otherwise known as ‘road tax’). However, they need to registered with DVLA and to display a ‘nil duty’ tax disc. This means they should display a ‘tax disc’ but no payment is required. Insurance – Although it is not a legal requirement, an insurance policy is strongly advised. This will provide some protection in relation to repair or replacement of the scooter if it is damaged, as well as cover for your own safety and that of other pedestrians or road users. Where do I want to use it? – Indoors – size of doors? Outdoors – level or rough ground? Are dropped kerbs available? How far do I want to go? Do I need to get it into a car? Does it dismantle easily? Who will dismantle it? How often? Where will my vehicle be stored and charged? Will I be in the vehicle for long periods? Can I use it easily and safely? Do I need it to be adapted for my particular comfort and safety? Do I need special seating, backs, armrests, footrests? Is there a clear indication of the amount of charge remaining? Is it available in different colours of frame and upholstery? Who will service my vehicle? Do I want extended warranty, insurance and a service contract? Mobility experts are keen to provide you with proper training to help you be in proper control and at ease with your newly found freedom. So ask them to accompany you in and around your home, and out to your local shops and venues. Your dealer will want you to feel confident so that you get the most pleasure and use from your product.